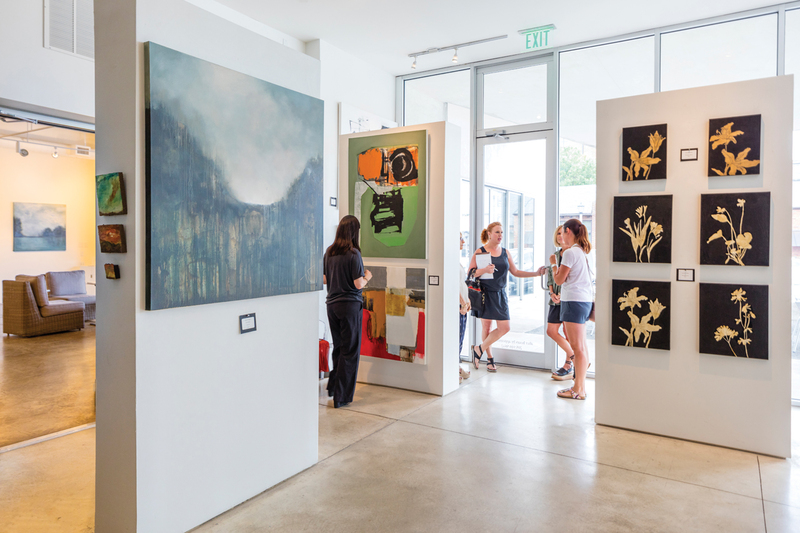 Situated in the heart of English Village in the site of a former gas station, Gallery 1930, with its clean lines and airy space, belies the fact that oil paint now reigns where the oil pan used to. Laura Vogtle opened the space with her mother, Kathryn Keith, in the fall of 2011. 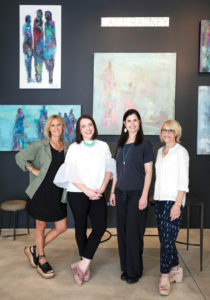 It began as a pop-up shop where the duo could feature the art of Meredith Keith, Laura’s sister, as well as other artists they favored. In no time, the gallery became a favorite spot for art lovers. Gallery manager Chelsey Whilding takes delight in highlighting each piece on display. The space features several local artists, including Wellon Bridgers, Jennifer Gibbs, Meredith Keith, Arthur Price, and Catie Radney. Since the other side of the building belongs to owner/restaurateur Al Raibee of Vino, many visitors enjoy stopping in at the gallery before heading next door for dinner.. Recently, Laura and Al worked together to create a unique shared space in the gallery—an elegant bar. In the daytime, a serene vibe inspires contemplation on the art represented. But as the sun goes down, the venue begins to glow with a convivial spirit full of cocktails and conversation. And the art only enhances the experience, creating the appearance of a well-appointed living room with a bartender. Gallery 1930 is currently gearing up for its next open house on September 20th. The event will feature new work by Keith, Bridgers, and Sally Threlkeld. Mark your calendar—your next favorite acquisition could be just this close. Neutral abstracts have been huge. That trend is not slowing down, but people are starting to crave more color and realism. We consult and help buyers try out different styles or sizes in a space. If we visit a customer’s home, we bring several choices. There is nothing like seeing the art in the space where it will live. Design Supply, my retail space at Pepper Place, features furnishings, accessories, and art. Room vignettes show how something might look in an actual home. Sometimes people are looking for something specific for a space they are redecorating. Other times, they buy art just because it speaks to them. Most of our buyers are looking for pieces in the $2,000 range, but we have works in a variety of prices and sizes. Smaller pieces are more affordable. We have everything from $75 to $7,500. If you love something, don’t miss out. Original art is one-of-a-kind. If you are connected to it, you can make it work in your space. Gallery 1930 • 1930 Cahaba Road, Mountain Brook. 205-870-1930. Hours: Tuesday-Friday, 11 a.m. – 7 p.m.